In recent years, the foundation's annual environmental campaign has reached more than 9,800 students, who get involved through the participation in environmental workshop, presentations and site visits. In recent years, the foundation’s annual environmental campaign has reached more than 9,800 students, who get involved through the participation in environmental workshop, presentations and site visits. 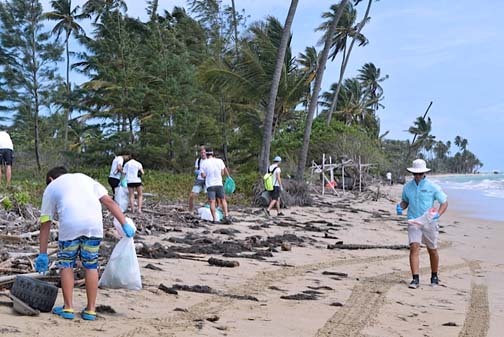 To celebrate ten years of promoting the conservation of the environment, the Soul of Bahía Foundation and Bahía Beach Resort & Golf Club held its massive annual beach cleanup recently. The effort was part of its most recent environmental campaign, “Conservation of Protected Areas and Sustainable Tourism,” and had the collaboration of students, Bahía Beach members and employees who came together to clean the mouth of the Herrera River and the beach. The initiative had the special collaboration of the Río Grande Mayor’s office, as well as companies such as Ricoh, Gonzalo Aponte Foundation, Coca Cola, Burger King and Pan Pepín, which supported this effort. The occasion also included the adoption of dogs that have been rescued through the “Cat & Sato Rescue Program” of the foundation, and the presentation of educational material about waste management, recycling and wildlife by María Fernanda Rodriguez, a Girl Scout committed to Nature Conservation. The Community Beach Clean up is held annually and over the years has had more than 2,300 participants. The initiative is part of the many efforts made by Bahía Beach Resort & Golf Club, which has a natural conservation program focused on wildlife conservation, habitat preservation and recovery, monitoring and conservation of waters, control of invasive species and; outreach and environmental education. Hey Buddy!, I found this information for you: "Soul of Bahía Foundation conducts beach cleanup". Here is the website link: https://newsismybusiness.com/foundation-conducts-cleanup/. Thank you.